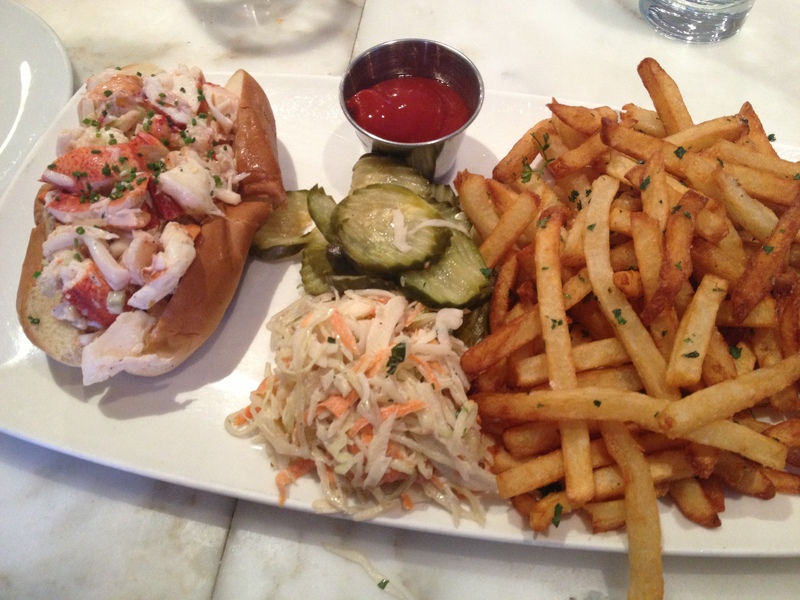 Nearly every “Best Lobster Roll In Boston” listing includes supposed heavyweights like James Hook & Co., Neptune Oyster, and Louie’s Alive and Kicking. 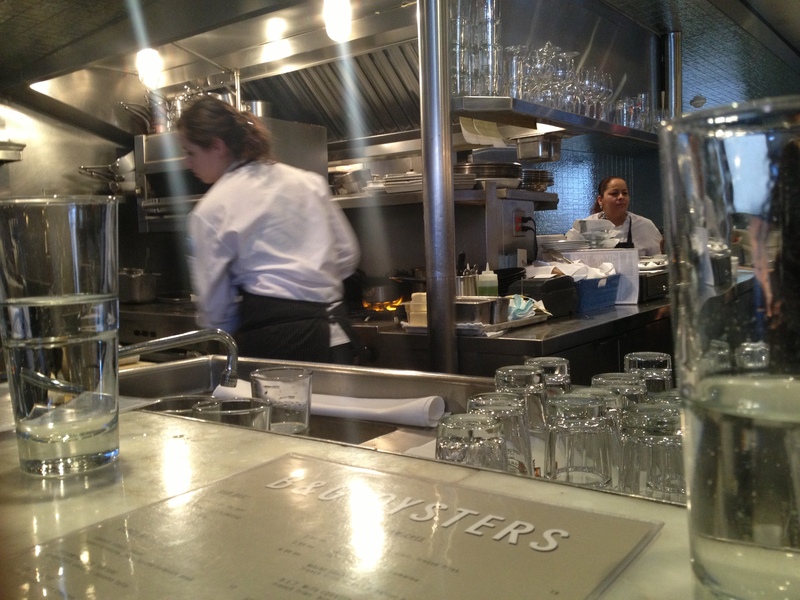 Another perpetual mention goes to B&G Oysters. We’d never been, and were very much looking forward to the visit – especially after walking all the way from our disappointing visit to Yankee Lobster in South Boston. 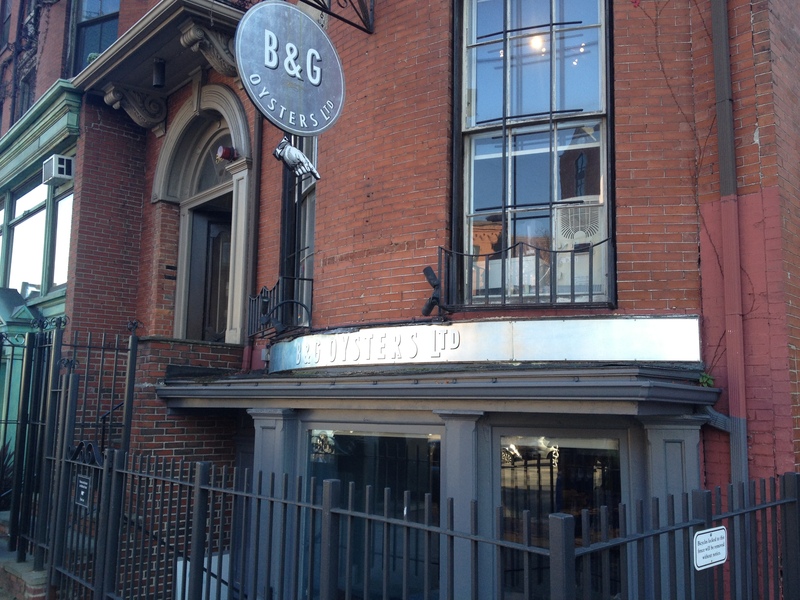 B&G is located in Boston’s South End which, if you’ve not been recently, continues to become more and more lovely. Beautiful brownstones, tree-lines streets, and lots of great restaurants and culture. B&G itself is located right on the main drag that is Tremont Street. The front entrance is closed off, so you need to go around the back and enter through an alternate entrance, before walking down into a really cool, hip setting. Dominating the restaurant is a large U-shaped bar, where we grabbed some stools overlooking the kitchen. The staff greeted us with joy. Since we intended to hit three roll joints on this crisp fall day, we opted to split a roll. In a brief digression, we can tell you with complete certainty that you can tell a lot about a restaurant by how they handle the split roll order. Do they (a) give you the roll as a single order as if you were one person; (b) do they do you the favor of providing you with another plate; or (c) do they split the sides and give you two mini-versions of what you would have gotten had you each ordered your own roll. Keep an eye on this, rollsters, and make your own judgement. Anyway, back to B&G (who served us as if we were one person). This was a very pretty roll, and very pretty serving. The roll itself was a bit higher-end than the standard split-top hotdog roll, but was in the same ballpark. It was toasted but, again, lacked the beautiful salted-butter bottom that is, on our opinion, one of the quickest and easiest ways to make a mediocre roll pretty good. The lobster meat itself was fresh and moist, lightly dressed. But the roll was apparently drizzled with lemon juice – a treatment that’s much better left to the customer. We felt there was too much lemon juice on this roll. It also featured chopped chives, which was OK, but was likely as much cake decorating as it was meaningful flavor contribution. By the way, the fries, coleslaw, and pickle sides were actually really good. A very pretty roll, and not bad. But far from lobster roll greatness. Hopefully better than the meal served for Restaurant Week 2013 – had a very bad experience today. Not happy!